The Scottish SPCA has been alerted to the number of animals caught in snares across the country. Wrapped around a tree and barely moving, a weak blink signals a badger caught in a snare is still alive. Last month the Scottish SPCA found the creature, but had him put to sleep to end his suffering. "The badger was clearly very badly injured and distressed and was suffering to the highest degree," explained a Scottish SPCA special investigations unit inspector, who has asked to remain anonymous. However, the inspector allowed STV News to accompany him during a typical snare search. 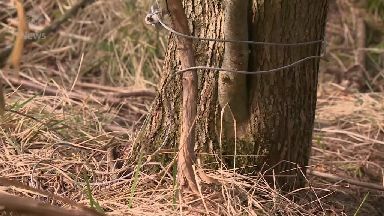 The animal welfare charity has issued a warning over the illegal use of snares. It has been alerted to a number of animals caught in snares, suffering a horrific end to their lives. Hundreds of snares are set in Scotland each year, and the Scottish SPCA has received more than 50 calls about snares since January 2018. Current legislation allows for the snaring of foxes and rabbits if the snares are legal and set correctly. As well as undertaking a training course to obtain a personal identification number from Police Scotland, snare users must adhere to strict rules. These include having a stop so the noose cannot close, making sure it is fixed to the ground and that it is inspected at least once a day. They also cannot be set where an animal is likely to become suspended, such as a fence or close to water where it could drown. 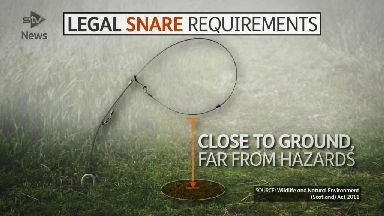 Snare users must also have landowner or occupier's permission. The Scottish SPCA inspector said: "We have been alerted to multiple animals caught in snares who have been caused an immense amount of suffering, leading to their death. "Snaring is legal subject to very stringent conditions. We see a lot of cases of illegal snaring, or legal snares being used illegally. "The use of snares is very technical and time-consuming and unless a person is willing to dedicate the time and effort, it's highly likely an animal's welfare will be compromised." In the case of the badger, the Scottish SPCA was only able to respond as the animal was still alive in the snare. If it had died, even though suffering had taken place, it would be up to Police Scotland to investigate. The charity also warned that snares can be harmful to pets, asking owners to be vigilant. "Snares are non-selective and can just as easily harm a domestic animal as well as non-targeted wildlife." "We've responded to calls from members of the public who suspect their cat or dog has been injured by a snare," the inspector added. The Scottish SPCA has said it supports an outright ban on the use of snares in Scotland. The inspector said: "The suffering an animal endures in illegal snares is horrific and while snaring continues, suffering will continue. "If anyone finds a snare, we ask that you leave it untouched and contact our confidential animal helpline on 03000 999 999 if you believe it to have been set illegally."